Umbrella wasps have an elongated body, black in color with yellowish colored legs and antennae. They are slow flyers and carry their legs down low and behind them as they fly. Their nest is an open egg clutch made of gray paper (made from wood pulp) and is usually found in the eaves of a home, mostly on the south and west sides. Those are the areas that receive the most sunlight and the umbrella wasps locate there for the heat that the sun provides. Their nest has no paper covering and the comb is clearly visible. Once the nest is removed and can be observed, the nest clearly looks like an upside-down umbrella, giving them the name Umbrella Wasps. 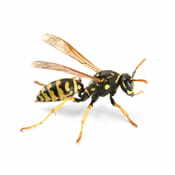 These wasps can also be very territorial especially when a house is being painted or roof work is being performed. Direct application of pesticide to the nest is required. Proper protection equipment is also recommended in most cases. We find these guys to be most aggressive in fall, but care should be used around these Wasps at all times. We encourage leaving treatment of these types of wasps to the professional especially if you are allergic to wasp stings. If you are an All-Pest customer please don’t attempt to treat these guys on your own. They are an included pest and will be treated at no additional cost as long as the nest is on the structure or is deemed to be within a reasonable distance away for the from the house on the same property as the house under the guarantee. Chuck Sullivan Exterminators provides an All Pest Service Guarantee so you won’t have to worry about eliminating bee infestations in your home or commercial building after treatment has been applied.